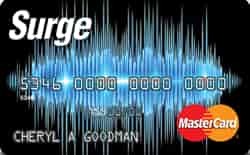 If you looking at the Surge website, they are very explicit that this is a card that is geared toward those with bad credit and that the purpose of getting this is to rebuild your credit so that your score would "SURGE"! Key question is: Who is the issuer and who is really behind this? On closer examination, I found out that the issuing bank is Celtic Bank and the folks behind this card is Continental Finance. Yep, these are also the guys behind the Verve credit card. Do they report to the three credit bureaus? They answer for this (according to their website) is YES - all three major bureaus. The second thing that you should look out for is the fees and rates. This is where it gets interesting. The rates and fees are listed in the above table. During the first year, an annual fee of $125 is charged. From the second year onwards, this is reduced to $96. However, a monthly maintenance fee (of $10 a month or $120 a year) is tagged on on top of the annual fee. Hence, for the first year, you have to pay a total of $125 in fees or $155 if you include an additional card. But from the second year onwards, the total fees rises to ($96 + $120) $216. The APR is also very high at 29.9%. When you have bad credit and are desperately trying to get an unsecured card to rebuild your credit, you would expect to pay some fees on the card and not to get the best rates. After all, the whole purpose is to increase your scores until the day you can get approved for a no annual fee card with a decent credit. Having said that, you should still compare fees among different cards because they can vary a lot. Below is table comparing the Surge fees to their peers. $96 annually Year 1 = N.A. , $96 annually Year 1 = N.A. $48 annually Year 1 = N.A. $45 annually Year 1 = N.A. As you can see, the Surge takes the dubious honor of having the highest fees among it's peers. The Verge credit card has identical fees and rates (also issued by Continental Finance - is that a surprise?). In the middle of the pac, cards like First Access, Total Visa and First Premier have almost identical fees. From the second year onwards, their fees are lower though they do charge a one-time application fee during the first year. Among the lot, the best value in terms of fees is the card from Credit One Bank. Their annual fees are lower ($35 to $99), they do not charge any monthly maintenance fees or application fees and their rates are lower. I would simply say this. If you have really bad credit and are looking for an unsecured card to rebuild it, then give this card a skip. The fees (along with the Verve - also from Continental Finance) is the highest among it's peers. A much better alternative would be a card like Credit One which has a lower annual fee and rates and no monthly maintenance fees. Stay away from this card!!! They are a complete, fees are out rages, you make your payment you have to wait 8 day's or more for the payment to hit your account, even though it's already out of my checking account!! And the interst is a joke I was charged a late fee because they didn't post my payment until after the due date! Complete scams!! Stay away from this card and company!!! Beware! None-it's a total SCAM-do not apply. I had a situation where my wife died of cancer. I lost a house because of medical and funeral Bill's. I fieled bankruptcy. I could not get credit Anywhere. Surge gave me credit of $5oo, yes, I had to pay a fee of $90 I kept the card for about 3 years. They increased my li.it every year. I now have cancer, which I have been fighting for 3 years. I had to let the card go. Of course, their interest rate of more than 36 percent was too much. I have been taking treatments for over 8 months now, and my cancer is diminishing. Capital one wont touch me. So, if they were to offer. I would not accept. I recently got a new card with a company called Blaze. Their interest rate is also high, but about ten per cent below Surge. They charged me 75 dollars to process the card. But for now, I'm ok with it. But I found with Surge, if you pay them on time, they will work with you. I hold no grudge against them. Nobody would give me the time of day for obtaining a credit card. My credit was in the low 400's. The only way for me to get a card was with Surge th rough Continental Finance. It may have cost me a non refundable $125, but it was well worth it! If you are responsible and mature about it, you know what I am talking about. I do not even think this company charged me the 29 percent on outstanding charges..you will figure out the loophole if you are smart! Anyways I just cancelled this card today and they are actually gonna send me back the $100 payment I made after I reached the 1 year mark last month. That is money I was not expecting back. After a year it costs a minimum of $10 a month just to have the card, not including the yearly dues. This card enabled me to get a high enough credit score where I no longer need to pay for a credit card. Bad reviews of this card are nonsense. Those people were given the chance as me. This card is a privilege for people with bad credit to obtain. If you really want to fix your credit, this card will help you. Customer service is fantastic as well. I'AM COURCIOUS ABOUT CREDIT lIMIT? I filled out the application and submitted it,not even a second went by and the a message popped up that they was having technical difficulty,I recieved nothing in my inbox regarding any kind of decision,so I went over to credit karma and sure enough they pulled my credit report,I'm outraged with this matter as it seems to me if the appilication didn't go threw then how was it they was able to pull my credit report. I recommend not appling for this card at all. This is the absolute worst card and customer service to deal with. I got the card with a credit limit of $500 to just get my credit started. As a student, I didn't want a high limit; so my grandmother and I got this in the mail and applied. When I got the card, I discovered that it wouldn't work anywhere I went. I tried to buy gas, food, etc., but the only place it worked was about 200 miles from home. So, I used it one time and didn't use it again. When I got my first statement, I paid it off, cut it up and then called to cancel it--since I couldn't use it anywhere. For the past week, my grandmother has gotten calls from Continental Finance that would always put her on hold and then repeatedly play the voicemail that they would connect her to the next available representative. Well, she never got connected. Finally today she got a real person who wouldn't talk to her because she isn't on the account. I called and they informed me that there was no request to cancel the card, but we have a record of when she called--about 10 minutes after she paid off the card. Now, I'm getting billed for the yearly service charge. I just don't get it. Apparently, they DON'T document ALL the calls they get. After I cancelled the card and tore it up, we saw reviews about Surge online... And I totally agree with all the negative comments. Paid it off on first billing, now getting charged service chgs after having cancelled the card. I kept receiving offers in the mail with this credit card. So after so many offers i decided to try the card out. After receiving a 500 dollar credit limit. I used the card and each and every on month to fees kept going up. And i didn't see any decrease on my bill. They keep you hostage to paying him and adding interest which is more then half of your bill. They also charge these outrages late fees. When a credit card company constantly sends you mail to get a card from them, it should be a red flag. I been having this credit card for 1 year and pays more on this bill and I'm still at the balance of 476.00 and the limit was 500.00 (SMH) on this credit card company. And that's not all if you pay more on your bill for that month it doesn't account for the next month. In saying if you pay more and late for the next month that overage that you paid don't mean a Hell of Beans to them... TOTALLY A REAP OFF. I was just approved for the unsecured Surge MC $500.00 CL. After years of not knowing the true importance of credit I decided to get my credit on track. I was discharged from a Chapter 7 in 12/2016. Since my bankruptcy I've been approved for a CapOne Secured card CL $200, Indigo cc CL $300, Express (dept store) $750.00, I have a credit builder loan with my Credit Union $1,000 and a secured cc with my Credit Union CL $500.00. What I learned is that to keep your utilization at or under 30%. Once I receive the card. I will do an update in 6 months to comment on the cards performance. Good luck everyone!!! I just applied and was approved for this card. My credit score is 589. My credit limit is $500. I was not required to pay a deposit. My card should arrive in 7-10 days. I have had this card for about 6 months. Limit is $500 and I spend at most $150 a month on the card and pay off in full every month like clockwork. I got this card in the midst of an app spree and also got credit one, quicksilver and walmart. Score was around 600. After 6 months of use of these 3 cards, my score is now 650. Got the Surge card. The fees and rates are sure high. But for folks like me who have been turned downed even by Capital One for a secured card, I can only be thankful. For me, it is important to actually have a Visa or Mastercard unsecured card because I rent cars occasionally to visit my mom. And without a credit card, rental companies will simply rip you off - sometimes charging you 3X in cash what it will cost if you had a credit card. I got the offer in the mail. Yikes, the fees are high. But I am trying to recover my score (which bottomed out at 485). I already have a Capital One and Fingerhut and my scores are now 550. I applied for this card and got approved for $500. For those who laugh at folks that get this card, remember that Capital One, Citi and BOA turn down secured card applicants everyday. Not everyone gets approved for secured cards. So for these folks (like me), we'll gladly pay up the fees to rebuild our credit. My score was 564 when I applied and had to deposit $150. It took 10 days to clear but I have been charging $50 to $100 every month on the card. Most of the time, I pay off in full. After 8 months, my score is now 610. I got the pre-approval mail. Went to their website and applied. They said I was approved for $500. But I was asked to deposit $150. I did not provide my debit or credit card number and after that, they said I was denied. I was quite ignorant when I got this card. Did not do much research. Having said that, my score did go from 570 to 650 within 9 months of using this card. But now that I know better, I would rather get a secured card like Opensky. I would only pay a $35 annual fee rather than the fees of this card - $125 annual fee first year, $96 the second year but they tag on a $10 monthly fee from the second year onwards. My payments get held up for 8 days which is really irritating. No other cards I know do this. Then if you want to pay by phone to avoid the hold, they make you pay a $10 fee! I got approved but needed to deposit $50. They put a hold for 10 days before I finally was shipped the card. When I pay online, the payment also gets put on hold. If you have this card, do not max out your limit. My score was 490 when I applied. I was approved for $500 but asked to deposit $500. It kind of sucked but I went ahead anyway because I had already been rejected by 2 secured cards. My deposit was put on hold for 10 days. After 2 months with the card, I did more research and applied for the Opensky secured card and was approved. Looking back now, I wished I had just applied for that because the annual fee was so much lower. After about 10 months with this card (and 8 months with Opensky), my scores improved to 590. I canceled the Surge card but kept the Opensky. I would recommend that you get a lower fee secured card before you even think about getting Surge. Having said all that, it did serve it's purpose and helped improve my score. I got the pre-approved mail and decided to apply online. I thought that I was approved for $500 but it turns out I have to put a $150 deposit. I decided not to go ahead. My scores then were 612. First Premier and Capital One denied me. So I gave this card a shot. I was approved but had to deposit $150. The fees were ridiculous and the APR insane. But my goal was to rebuild my credit. So I simply charged $50 to $100 a month and paid it off every month to avoid interest charges. After 9 months, my scores went from 570 to 650. I canceled my card before the 1 year anniversary to avoid the annual fee for the second year. I applied online and was approved but had to pay a deposit of $50 for a $500 credit line. Score was 535. But I re-read the terms and conditions again and decided not to give the deposit and was subsequently denied. The annual fee is ridiculous. Then there is the $10 monthly fee. I did some research and got a capital one secured instead. Fee was like $35! compared to $120 for this card. Simply Crazy!! I have had the surge card for 3 months now. I have been rejected by many other cards and this one accepted me. So far, I have no problems. I pay my bill electronically and so far every thing has been smooth. I got this card when my credit score was 580. The limit I got was $500. After about 9 months, my score has improved to 640. They do report on time and it is serving it's purpose. I will cancel it before the year is up to avoid the monthly fees. With my score, I should be able to get a much better card now. I also got a $500 limit. The most I ever put on the card is $200. I pay off all my bills in full. I plan to close this card before the end of year 1. I got pre-approved and when I applied, they said I was approved for $500, but asked to deposit a $50 check. Guess I got the partially secured card. I paid the deposit and have started using the card. My score was 587 BTW. My score was 590 when I applied. I got rejected for the unsecured version but told to cough out $150 as a deposit for the $500 credit limit. I decided against it. I think with my score, I should be able to get a better card. Lots of folks appear to be made with this card. For me, it has worked out. Got this card in mid 2015. Limit was $500 like everyone else. Scores were 600, 570, 590 TU, EQ and EX respectively. Fast forward 1 year later, and my scores are 700, 670, 685. All I did was to spend $100 a month on the card (20% utilization) and pay off in full every month. EX score was 605. Approved for $500 but had to deposit $150. You cannot use this card at gas stations because they will place an authorization on your card with an amount that is more than the price of your gas. So here is my experience applying for this card. I got a "pre-approval", then proceeded to apply online. I was told I was approved for $500 limit. Then they requested a debit or credit card information for a $50 deposit that would be withdrawn from my debit card. I decided not to give the info. Next thing you know, I was declined. Looking back, it seems like what happened was that I was approved for a "partially secured" card. My scores were around 570 when I applied. I was approved for $500 but needed to put down a $50 deposit which I did. I received the card about 10 days later. I have the surge credit card and would say that it has worked out for me. Score was 525 when I got approved. 18 months later, my latest scores are now in the 670 area. Since the limit is $500, I made a conscious effort to only spend $50 on the card (10% of limit) and pay off in full every month because the APR is so high. Here's my advice if you do get this card (after some painful experience). Pay online and your payment will be on hold for 8 days. It might bother some of you. But the way around this is to use only a fraction of your limit. I charge no more than $100 a month on the card so the hold does not bother me at all. Remember, this card is solely for rebuilding your credit. Do not pay by phone or it will cost you $10 in return for less hold days.